When Construction Accidents Occur As The Result Of Faulty Materials, Who Is Liable? No personal injury case is ever cut and dry, and oftentimes, proving liability boils down to several different factors, namely proving that the defendant was in the wrong. For this reason, it is always best to consult with a Miami personal injury attorney before facing an injury claim on your own. This is especially the case when the accident in question is a construction accident, and when the reason for the accident had to do with cheap materials. If you or a loved one was injured in a construction accident that was the result of cheap materials used at the worksite, liability could rest with one of two entities: either the company that made the materials or whoever was responsible for the project. In some instances, both entities may be held liable. For help proving liability at this difficult time in your life, reach out to the Miami construction accident attorneys at Spencer Morgan Law as soon after your accident as possible. All personal injury cases hinge on proving two things: negligence and liability. Negligence, according to Florida law, refers to an action or inaction that goes against what any other reasonable person would do in the same situation. Liability is the notion that the defendant is responsible for another person’s injury or property damage. Typically, we see negligence and liability come into play in car accident cases, medical malpractice cases, and slip and fall claims, but they can also play a role in many other incidences, including construction accidents, product liability claims, and work-related accidents, to name a few. For instance, if a product is defective and a person gets injured while using the product as it was intended to be used, the injury gives rise to a products liability action. In the case of a construction accident caused by faulty materials, injured parties may be able to file for a negligence action and a products liability action. Oftentimes, it is the responsibility of the company or foreman to select the materials to be used on a construction project, and even for them to inspect them for quality. If a company purposefully orders cheap materials to “save money,” or if they fail to inspect a batch of materials for quality assurance, they may be held liable for your injuries. However, in order to prove that the employer or contractor is liable, you may be able to prove that their ordering cheaper materials or failing to properly inspect materials was in some way an act of negligence. For instance, if the soil in the area in which a building is being constructed contains mass amounts of sulfate and the contractor is aware of this and opts for rapid hardening cement for the foundation instead of sulfate resisting cement, they could be held liable if the foundation falters and causes significant damage. However, if the construction manager made sound choices based on the knowledge they possessed, they could not be held liable for any accidents or injuries. More often than not the manufacturer will be held liable for cheap materials that caused an injury. However, proving that the manufacturer was negligent in some way can be extremely difficult, as most construction materials undergo several processes before being released for resale. For instance, in order to create a batch of cement, raw materials must first be extracted; those materials are then ground up and burned to create “clinker,” or the raw material from which all cement is made; a small amount of gypsum is then added to regulate how the cement is set; a few other additives are mixed it; the mixture is ground up again; and then it is shipped. At any point in this process a mistake could have been made. It is up to the plaintiff and their attorney to prove where, exactly, the mistake was made, which is extremely difficult to do. 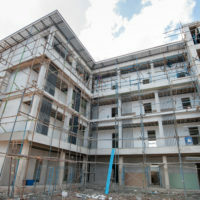 Proving liability in a construction accident that was caused by faulty materials is no small feat. However, it is not impossible. For the best possible chance at walking away with the compensation you need to recover in comfort, call Spencer Morgan Law at 305-423-3800 to schedule a free and confidential consultation today.